Any news on the 2014+ skid plate? I know the 2010-2013 is out, what's the word on the 2014+ version? My intercooler is unprotected at this time. Last edited by socaladam; 06-03-2016, 04:10 PM. small rock kicked up or did you hit something? is that leaking? Last edited by Wapitihunter; 06-05-2016, 09:40 PM. Nothing yet as far as a leak. Not sure what it was but I really want to prevent any additional damage. Wow. Your sure that's not leaking?! It's not leaking because it's already all dried up! Yea, I'm sure. It's a huge dent but no hole yet. I got up to 14lbs of boost and no leak from what I can tell. Hopefully I got really lucky but I'm concerned that my luck might run out and I'll have to pay for a new intercooler or someone to fix mine. I'm really really hoping that AEV is able to release the 2014+ skid plate ASAP. This are air to air coolers, no fluid. I don't hope/expect the AEV one to 100% protect from flying small debris like rocks, would just like a bit of shielding from ground impact. The more ya know! I figured it was just a normal radiator style cooler. Thanks! I'm sure my boost goes much higher, but at 14psi of boost that's 2x ATM and should suffice for finding leaks. I'm hauling a decent load this weekend so I'll get to test out the boost on one of the big hills here. Still waiting on word from AEV... I'm impressed with the bumper but not impressed with that fact that it leaves the intercooler vulnerable to road debris and/or damage. 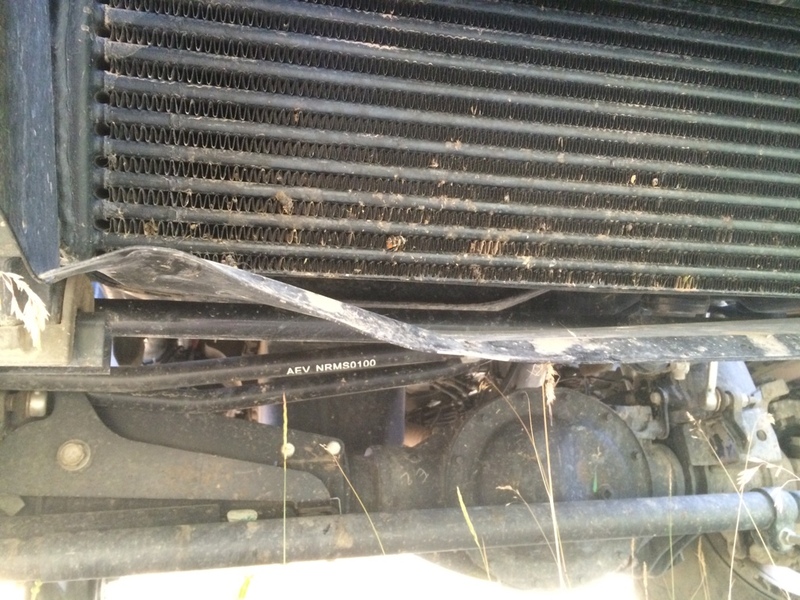 No issue with leaking from the intercooler. Ran up the steep hill with about 1/2 ton in the bed and boost did not drop off. I feel like I'm playing craps. Not getting ahead but not losing either. Hopefully AEV will find it in their infinate wisdom to release the skid plate for us 2014+ owners who purchased the bumper. I'm sure that I'm just venting here, but I'm having a really hard time understanding how a company like AEV can sell a product like the front winch bumper and not have the need to protect the intercooler of a diesel truck. This is a $500 part (new intercooler) and there is zero protection provided. Why in the world would they make a skidplate for the 2010-2013 truck and not the 2014+ when the purposely sell the prospector package? Here is your intercooler skid/protection. They also make protection for pretty much all of the undercarriage.